Visions of the future: Unlimited Theatre and RashDash collaborate on a whirlwind of speculative scenarios on technology and the body. Future Bodies is a bold, challenging look at the potential impact of technology on the body. It raises a lot of interesting questions and tackles them in a robust and entertaining manner, even if it never quite coheres into the show it could be. A RashDash/Unlimited Theatre collaboration, co-produced by HOME, Future Bodies is a work of fiction, but has been created in consultation with scientists, and some of its ‘futures’ feel just moments away. Scene after scene unspools before us: a company pressures an employee to get an ‘efficiency’ implant; a deaf woman is accused of being intransigent for not wanting the ‘upgrade’ that will allow her to hear; a widow longs for the procedure that will help her get over her wife’s loss. A series of snippets and snatched conversations throw out scenario after scenario, each posing a dilemma. What does it mean to eat human meat, if that meat has been grown in a lab? Does a criminal have the right to refuse treatment that will make him harmless? Who gets to define what counts as a disability and whether it needs ‘curing’? It’s a thought-provoking piece, and often very funny, although the scattershot nature of the scenes means few things stick. And some of the biggest points – such as how economic inequality will impact who gets to be ‘better’, further entrenching an already unfair system – feel a little rushed over. Still, when these vignettes work, they can be incredibly powerful, and a talented cast serve the writing well. A scene where Yusra Warsama tries to limit her employer’s reach into her life feels eerily prescient. Alison Halstead – pleasingly slick as the head of a company that leads the market in ‘brain enhancements’ – is also deeply affecting as a woman quietly undone by grief, as is Kate Maravan’s attempt to convince her dying wife that ‘upgrading’ beyond the physical will keep them together. Lara Steward, communicating in BSL and speech throughout (much of the production is signed and captioned) gets the biggest laugh of the night when she slyly uses her signing to insult a patronising woman to her face. But she also movingly tackles a question that is already relevant now: in an overburdened environment and a world fast going to hell, how do we justify having children? How do we reconcile the animal need to reproduce – and the sheer physical weight that compulsion has for some people – with the intellectual idea of overpopulation? A charismatic Deshaye Gayle is particularly good both as Steward’s partner, who may be agreeing to a baby for reasons that aren’t in his control, and as a killer who would rather hold onto his violent identity than avoid punishment for his crimes. Rhys Jarman’s set flows and adapts around the performers, managing to eerily evoke both a scientists’ clean room and a butcher’s workshop. Sarah Readman and Josh Pharo’s lighting and video design are cleverly utilised and Becky Wilkie’s anthemic music is used both as defiance from those who embrace this future and resistance from those who don’t – or can’t afford to (though I was unable to fathom why she seemed to be dressed as Mystique from the X-Men). Although directed with energy by Abbi Greenland and Helen Goalen, the production would benefit much from a tighter edit and a shorter runtime. The final switch to movement, as the performers writhe and thrash on a dirt stage, jars badly against the talkiness of the rest of the piece. While it’s great to see a production that uses captioning throughout, sometimes this feels like a style choice rather than an accessibility one: some captions were blurred or blocked by the performers, some projected in ways that made them hard to read. Cool as it looks to have words projected down the side of the stage set, it means that some of the audience can’t even see the end of the sentence, which rather defeats the point. 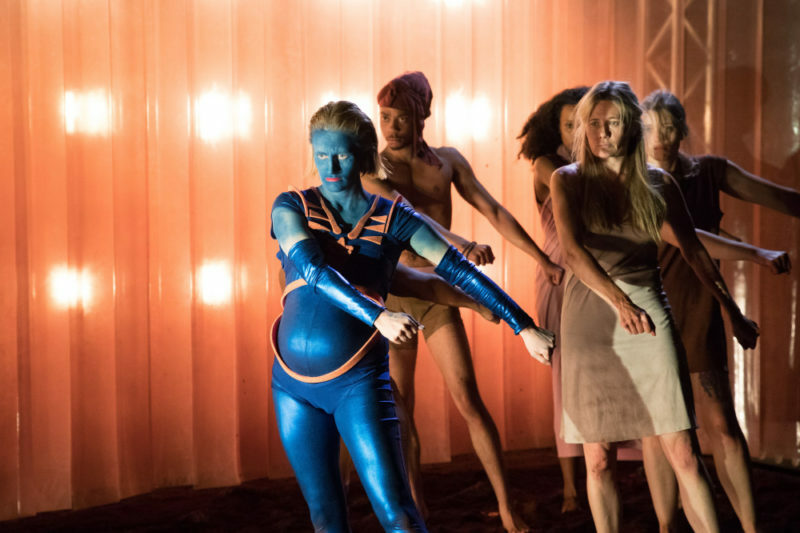 Future Bodies is on at Northern Stage until 18 October. More info here.